Kuala Gandah Elephant Sanctuary is located in Pahang and is a good place to go for a time of relaxation with your friends or family members. Plan to spend about 2 to 3 hours here. 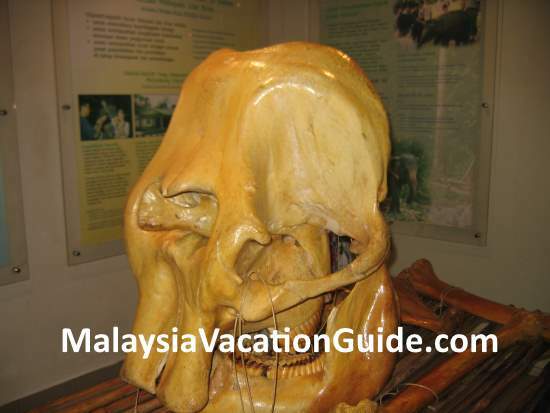 Run by the Department of Wildlife and National Parks (DWNP or Perhilitan) of Malaysia, this place is indeed a sanctuary for the wild elephants that have been relocated here. These wild elephants were captured when they encroached (or rather the human beings encroached into their habitats) into the oil palm plantations and villages. The Elephant Translocation Team which was established in 1974 will begin to track the wild elephants once they got the news of the sight of the elephants. The Kuala Gandah Elephant Conservation Centre was established in 1989. Using the trained elephants from Thailand and Myammar, the team will set to capture the elephants using tranquilizers and transport them to the centre using trucks. 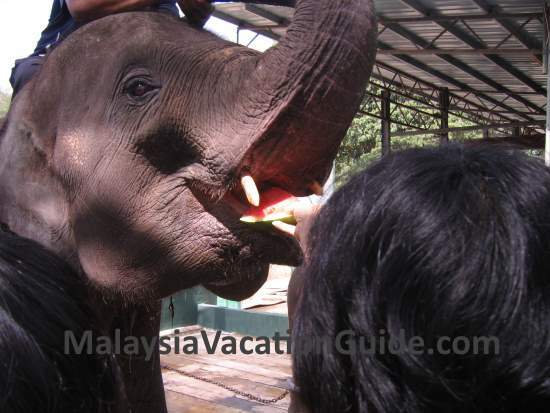 The elephants were being readied for the visitors to feed them fruits such as watermelons and papayas. Feeding the elephant. This centre is expected to be visited by more than 180,000 visitors this year. These wild elephants are then re-located to other protected natural habitats such as Taman Negara (National Park) which is located in Pahang. 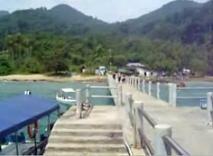 The other natural habitat is Sungai Ketiar, Terengganu. As of today, more than 500 elephants have relocated. This centre has 17 elephants currently of which four are males. The oldest are two 70-years-olds named Mek Bunga and Lokimala and the youngest one is one-year-old Langsat which was rescued from the forest in Gua Musang, Kelantan. A little bit about these endangered animals in Asia. Currently there are less than 40,000 wild elephants in Asia with around 1,200 in Peninsular Malaysia. The elephants form part of the natural habitat of the jungle where they help to create natural pathways by knocking over trees, hence allowing smaller animals to feed. At the same time, they act as agents to disperse the plant seeds in their dung. Over time, men began to look for more space in their effort to feed the increasing population. Forests have been converted to plant crops such as oil palm, rubber and other crops on a big scale. This caused encroachment of the natural habitat of the elephants. As a result, many elephants are forced to look for food in these plantations causing damaged to the crops. Hence, the role of the Trans-location Team is crucial to the survivor of these elephants. 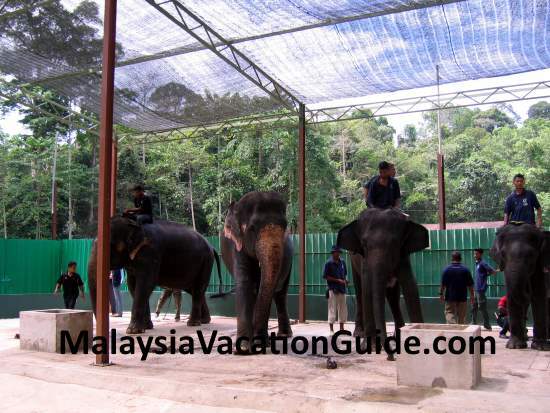 There are a few activities that you can do while you are at Kuala Gandah Elephant Sanctuary. No fees will be charged for all of these activities. Read more about the elephants at the museum. This museum at Kuala Gandah Elephant Sanctuary in the vicinity of the office is small but good enough for you to learn more about this endangered animal. The skull of the elephant is also on display here. Plan to spend about 20-30 minutes here. Sit down in the comfort of the air conditioned room and watch the video on issues that affect the wild elephants, their diminishing habitat and the role the Trans-location Team play in ensuring the survival of these endangered species. The duration of the show is about 20 -25 minutes. All visitors to the centre will have the opportunity to participate in this program. There are about 6 elephants that can be fed with fruits such as watermelon and papaya. All you need to do is feed the elephant with your hand holding the fruits. You can feed it by putting the fruits directly to the mouth of the elephant or by letting the elephant uses its trunk to take the fruits. Fruits will be provided at the centre. This will be a fun time for your children. Remember to take a cap or sun-glass and a bottle of water as this place can be hot and humid in the afternoon. 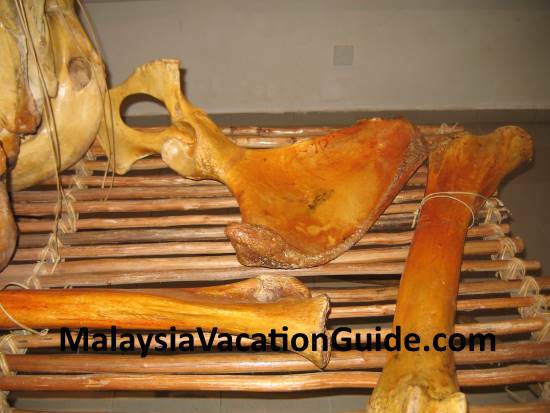 The replica of the elephant bones can be observed at the museum. Riding the elephants. This activity is no longer available. The ride is no longer available as many animal rights activists protested against this activity. Depending on the level of water, you may be able to see the elephants bathing at the river nearby. Remember to follow the instructions of the care givers if you are given the opportunity to bathe them. Bring along your tower and clothes for changing as you will get wet. Changing facility is available here. As with elephant riding, do your booking 3 days in advance with the centre otherwise you may be disappointed as it is usually crowded during the weekends and public holidays. There is a small stall that sell light refreshments at Kuala Gandah Elephant Sanctuary. 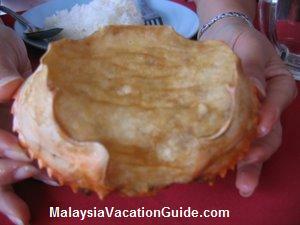 As there is not much variety of food here, it is better to bring your own snacks and drinks while you are here. There are some benches that you can use to have your picnic here before and after the scheduled activities. Souvenir such as T-shirts can also be obtained here. Visitors hand feeding the elephants. Visitors bathing the elephants in the river. See the a short video of the elephants. The office hours of the centre. RM10/adult and RM5/child. The Kuala Gandah Elephant Sanctuary is funded by DWNP or Perhilitan with an annual grant of RM700,000. Donations are also received from the public. 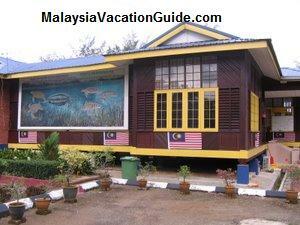 The Kuala Gandah Elephant Sanctuary is located about 160 km or 2 hours drive away from the city of Kuala Lumpur. 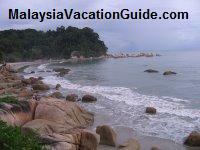 It is in the state of Pahang at the east coast of Peninsular Malaysia. Use any of the highways or trunk roads to get to Karak Highway. From here, use the East Coast Expressway and exit the Lanchang toll. Turn right at a T-junction and go straight along the road. Follow the signboards to Kuala Gandah Elephant Conservation Centre. 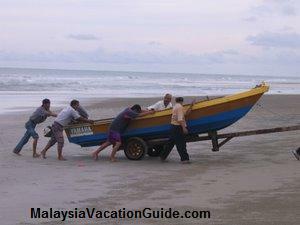 As this town is small, the nearest hotels nearby will be at the bigger town of Temerloh towards the east or Bentong towards the west. 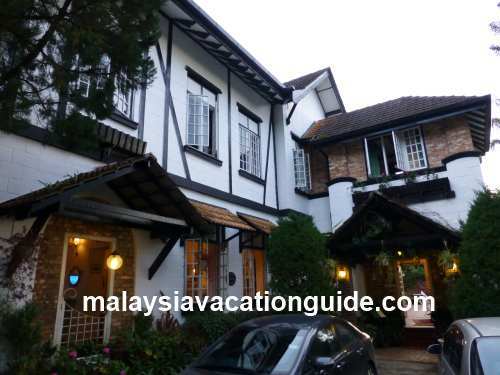 A reasonably priced hotel at Temerloh is Seri Malaysia Hotel. 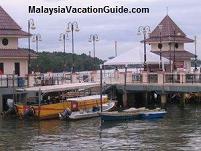 Check and compare the hotels rates at Temerloh. 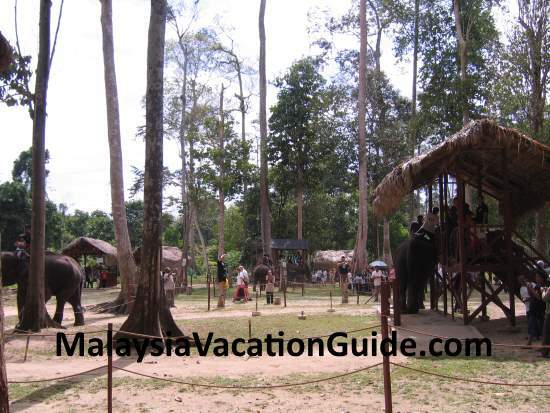 The compound at the Kuala Gandah Elephant Sanctuary where the activities involving the elephants are held. Remember to take a cap as it can be hot and humid in the afternoon.